Coordinates: 25°19′60″N 83°00′00″E﻿ / ﻿25.3333, 83 The Indian city of Varanasi, (also known as Benares, Banarasm Benaras, Kashi, or Kasi), considered one of the seven sacred cities within Hindu belief, is a constant attraction for devout pilgrims seeking the holy, healing, waters of the Ganges River. 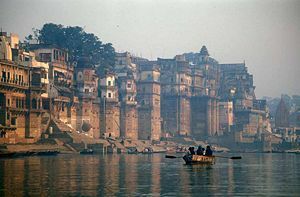 The Ganges cuts through Varanasi, providing the city with a large abundance of river access points. 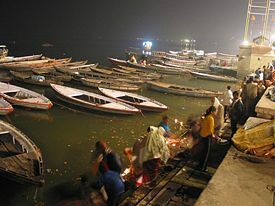 The large quantity of river front property contributed to the early development of Varanasi as an important religious city. It is not only one of the oldest continuously inhabited cities in India, but throughout the world as well. A major city of Hindu learning, Varanasi is commonly referred to as the the "city of temples and learning," a name which reflects the rich cultural heritage of the city. As a cultural nexus in northern India, Varanasi has pioneered its own distinct style of music, as well as having educated many distinguished intellectuals. It has remained a center of religious, educational, and artistic activities throughout its history. Hindu belief regards Varanasi as the site of the creation of man, as well as the city in which the god, Shiva, spent much time. The city is also important to Buddhists, being only 8 miles from the site of Buddha's first lecture in Sarnath. Buddha is known to have traveled and taught in Varanasi as well. The most distinct feature of Varanasi is the Ganges River, which draws pilgrims to its shores for its religious qualities. Geographically, the Ganges River defines the borders of Varanasi through its flood plain. Due to the annual floods that plague the area, Varanasi is necessarily located on the high ground above the dangers of the roaring rivers. On the opposite side of Varanasi from the Ganges lies the Varuna River, which also defines the shape of the city by a flood plain. Despite the fact that Varanasi is located on relatively high ground for the area, the mean elevation only reaches 80.71 m.
Because Varanasi has been continuously inhabited for such a long period, a debate rages about the borders of the ancient city in correlation to the modern metropolis. The search to define the original Varanasi is further complicated by conflicting reports in ancient documents, some of which sharply diverge when measuring natural features. Many ancient documents also refer to Varanasi as being situated between the Ganges, Varuna, and Assi rivers. This topic is particularly contentious as modern scholars have failed to locate remains of a river Assi notable enough to be cited by ancient historians. Varanasi, like much of India, experiences long hot summers and cool winters. Officially classified as a subtropical climate, India experiences extreme variation in temperature and weather conditions between seasons. Winters in Varanasi, and surrounding areas, are remarkably cool, with temperatures often reaching the low 40s and 50s on the Fahrenheit scale. Summers, however, are much warmer in the holy city, with temperatures often reaching 90-115° Fahrenheit. Summer warmth also brings along its own natural hazards, such as the challenging monsoon season that precedes summer annually, and the harsh dry winds called Loo that sweep across the subcontinent during the summer. During the summer, water levels become increasingly important to the survival of the city. In recent years pollution and dam construction have combined to lower the water table of the river, a fact which is made more threatening by the low annual rainfall of only 44 inches (1110 millimeters) . Situated on the banks of river Ganga, Varanasi attracts thousands of Hindu pilgrims every year. The idea of Varanasi as a religious site traces back to the earliest creation myths of the region. One myth, that gained popularity with the rise of Hinduism, states that the Varuna and Assi rivers flowed out the first person when the world was created. Guided by this story, Varanasi (the area between the two rivers) came to be regarded as the holiest area of land. The vision of Varanasi as a religious center was further enhanced by the Hindu idea that the city was the site where the Hindu god Shiva spent his time. Devout Hindus who complete pilgrimages to the region believe that by bathing in the rivers, Shiva will aid in wiping clean any mental or emotional impurities. It is also believed in the Hindu faith that by dying in the city of Varanasi, a soul can effectively bypass the reincarnation process. The idea behind this concept is that Varanasi is so holy, that any soul who leaves a body in its borders is naturally pure enough to enter the afterlife without the purification process of rebirth. Essentially the city is thought to endow its inhabitants, whether dead or alive, with the highest form of spiritual purity. Over a million pilgrims voyage to Varanasi annually to take part in the cleansing associated with the city. While Varanasi is predominately associated with Hinduism, strong ties to Buddhism and Jainism also exist in the area. A large park, called Sarnath, which lies on the fringes of the city is thought to be the original site for the inception of Buddhism. It is thought, by followers of the philosophy, that Sarnath is the site where Gautama Buddha gave his first lecture on the guiding tenets of Buddhism. After delineating the goals of the philosophy, Gautama Buddha declared the park as a pilgrimage site. Following this announcement, Buddhist pilgrims flock annually to the area, in hopes of fulfilling their religious duties to the greatest degree possible. Other pilgrimage sites announced with Varanasi include: Kushinagar, Bodh Gaya, and Lumbini. To commemorate the original lecture of Gautama Buddha, Buddhists in the area preserve the Chaukhadi Stupa at the spot where he was believed to have stood during the original sermon. 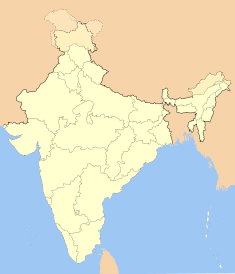 For Jainists, the historical significance of the region draws from the belief that it is the birthplace of Parshvanatha, an important figure in the religion. A lesser felt cultural influence in the area is Islam, that while visible, is not often considered a prominent religion in the area. 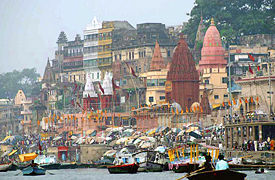 As a religious center, Varanasi is dotted with a wide variety of temples and other places of worship. While there are many smaller temples that have importance to their congregation, many of the temples of Varanasi have gained significance on a worldwide scale for their alleged holy properties. Perhaps the most famous of all the temples of Varanasi, the Golden Temple (Vishwanath temple) attracts large gatherings of devout Hindus. According to Hindu belief, the Golden Temple is the resting place of the Jyotirlinga of lord Shiva. The relic is thought to have healing properties and be able to elevate the spiritual level of all who see the remains. The Golden Temple, made famous for religious reasons, also gains attention for its unique architecture and historical importance. The structure on the banks of the Ganges was an early focus of rivalry between Hindu and Muslim worshipers. According to historical sources, an early temple was destroyed in a religious struggle between the two religions, and a Muslim mosque was built over the remains of the Hindu temple. In response, a Hindu temple was built nearby its original location. The contention over the space continues to be a cause of tension between the religions. 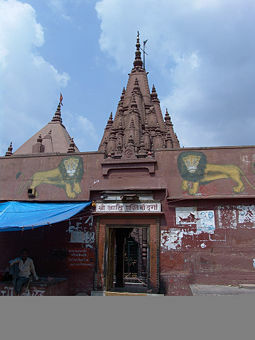 In another possibly contentious move, the management of the temple was assumed by the Uttar Pradesh government in 1983. Due to the government's actions, all current and future decisions about the temple rest within the authority of Dr. Vibhuti Narayan Singh. Many hope that a centralized authority will ease tensions regarding the temple. Another significant temple in Varanasi is the Durga Temple, also referred to as the Monkey Temple. While the Golden Temple attracts Hindu and non-Hindu tourists alike for its rich architecture and unique beauty, the Monkey Temple is not often included on touring itineraries for non-Hindus. In this temple, non-Hindus are not allowed to enter the inner sanctum, and must be content to enjoy the beauty of the outer courtyard only. Visitors to the Monkey Temple also immediately recognize the root of its unique name: Monkey Temple derives from the large number of monkeys that are visible in the decorations of the temple. Monkey depictions are not the only unique feature of the temple, as the architecture of the temple is also distinct. Following the traditional Nagara style of architecture, the temple is distinguished by spires and a bright red color. According to Hindu ideology, the color red is representative of the Hindu goddess Durga. Visitors who wish to view a representation of Durga need look no farther that the large central statue of the goddess. According to legend, the central Durga statue of the temple was not made by human hands, but appeared due to celestial intervention. The tern ghat has significance as both a noun representing a place for spiritual cleansing, and a verb describing the actual cleansing process. Due to the religious significance of the Ganges River and Varanasi itself, the area is marked by a large proliferation of ghats for spiritual reasons. Over 100 cleansing gnats exist in Varanasi on the river's edge, and pilgrims who bathe in the Ganges expect that spiritual rebirth will occur as a result. Some of the ghats on the Ganges, however, serve as cremation sites for devout Hindus, who believe that souls can better reach the afterlife near the Ganges. The trend for cremation on the Ganges can be traced back to early Hindu histories, where it is said that Lord Brahma sacrificed ten horses. Other traditions state that the Hindu Goddess Parvati hid one of her earrings on the banks of the Ganges, and the Hindu lord Shiva spent eternity looking for the lost adornment. Myths like this reinforce the idea that the Hindu gods are present on the banks of the Ganges and are able to intervene on behalf of pilgrims. Ghats have always been a significant part of life in Varanasi, serving to dictate religious life as well as secular life. In regards to secular life, housing prices in the city are dictated by their distance from the ghats. Due to the smoke from cremation and large amount of pilgrims at busy ghats, housing near the ghats is seen as less desirable. Middle to Upper class housing is located much farther away from the busy river's edge. Due to the wide variety of cultures that intersect in the religious city, Varanasi has long been considered a center for cultural development and artistic expression. Most notably, the art of the city represents the diversity of its inhabitants, ranging from traditional handicrafts like woodcarving to modern expressions of cultural diversity. The area is particularly noted for its eminence in wood crafts, metallurgy, ornamental pieces, and toy making. While physical artistic production is a vital part of the Varanasi culture, the city also receives attention for its literary legacy. Varanasi has played host to a wide variety of famous Indian writers, including: Kabir, Ravi Das, Tulsidas, Bharatendu Harishchandra, Jayshankar Prasad, Acharya Ram Chandra Shukla, Munshi Prem Chand, Jagannath Prasad Ratnakar, Devaki Nandan Khatri, Hazari Prasad Dwivedi, Tegh Ali, Kshetresa Chandra Chattopadhyaya, Vagish Shastri, Baldev Upadhyaya, Vidya Niwas Mishra, Kashi Nath Singh, Namvar Singh, Rudra Kashikeya, and Nirgun. Much of the literature of the area is a result of the multitude of universities and colleges in the region. As shown in the literature produced, a major focus of education in the region is the traditional epic form, the root of most Hindu legends. Music is also a cultural arena for Varanasi, with many of artists of the region choosing to express themselves auditorily. As is also seen in the literary scene, traditional forms are highly visible. In many cases the folk music and traditional methods of dancing continue to be popular, gaining an audience over more modern techniques. Prominent among the goods available to western markets was luxury silk, handmade in the traditional way to be worn in saris. While western nations did not desire the silk in order to make saris, the intricate weaving of Varanasi silk was recognized globally as a forerunner in the textile market. In more modern times many of the exports from Varanasi are traded on a much smaller scale. Instead of reaching into the far markets of western Europe, dairy product exports and betel leaves reach closer markets. The trend towards local trading is beginning to change, however, as the Indian Railway has selected Varanasi to serve as a major factory center. Many hope that the Indian Railway will be helpful in transitioning the economy from cottage industry to large scale production. As more of the world becomes aware of the cultural and religious significance of Varanasi, the economy is expected to be bolstered by returns from the tourism industry. The tourism industry is already beginning to form a large part of the Varanasi income, but hopes continue that this particular part of the economy will boom as more and more western nations become aware of the riches that Varanasi has to offer. A major concern for Varanasi in the face of increased tourism and industrialization are the transportation problems that plague the area. While the city itself is connected to other major metropolises through air transport, travel within the city limits still proves problematic. 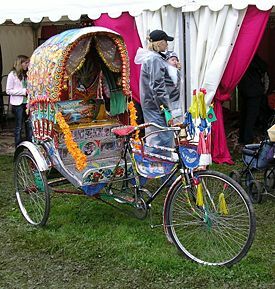 Rickshaws and Auto Rickshaws are still a common site of Varanasi streets, and while these modes of transportation are picturesque, they contribute to traffic jams and slow movement on city streets. ↑ Government of Uttar Pradesh. Ranking of Districts by Population Size in 1991 and 2001 Retrieved December 16, 2007. ↑ Government of Uttar Pradesh. Ranking of Districts by Population Density Retrieved December 16, 2007. ↑ Rana P.B Singh, Varanasi as Heritage City (India) on the scale the UNESCO World Heritage List: From Contestation to Conservation Swedish South Asian Studies Network. Retrieved December 16, 2007. ↑ DelhiTourism.com. Varanasi tourism Retrieved December 16, 2007. ↑ The Tribune. December 6, 1998. Countrywide alert on Masjid demolition anniversary Retrieved December 16, 2007. ↑ National Informatics Centre, Government of India. Shri Kashi Vishwanath Mandir Varanasi Retrieved December 16, 2007. ↑ Tourism of India. 2003. Varanasi Retrieved December 16, 2007. Singh, Rana P. B. Varanasi as Heritage City (India) on the scale the UNESCO World Heritage List: From Contestation to Conservation. Swedish South Asian Studies Network. Retrieved November 3, 2007. District Varanasi Official Website - Official website of Varanasi District and City Retrieved December 13, 2007.